We are very happy that an article that we wrote about Opus 501 has been choosen as the cover story for the November-December 2018 issue of "Theatre Organ" the Journal of the American Theatre Organ Society. If you are a member of ATOS, you can read the article on pages 28 through 35. 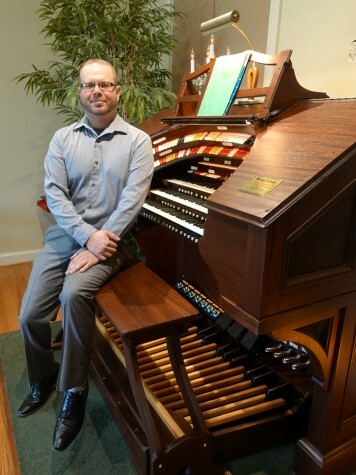 The September meeting of the Susquehanna Valley Theatre Organ Society (SVTOS) was held at the Howard-Fenner residence and featured Justin Nimmo from Indianapolis, Indiana, playing Opus 501 (pictured below). We are grateful to Justin for allowing us to use his recording of “Wake up And Live” as background music on our website homepage. This recording was made while he was practicing on Opus 501 for his September performance. Completion of the organ in 2018 was timely because it coincided with a six-month renovation of the Capitol Theatre in York, Pennsylvania. The Capitol Theatre is home to the 3-manual, 20-rank Wurlitzer hybrid that is used for chapter meetings of the Susquehanna Valley Theatre Organ Society (SVTOS), of which Barry has been president since 2012. Because the Capitol was inaccessible for six months, all of the SVTOS meetings between May and October 2018 were held at the Howard-Fenner residence and featured Wurlitzer Opus 501. The August meeting featured organist Tedde Gibson from New Carrollton, Maryland, who is pictured below at Opus 501. Despite having 214 stop tablets, 7 toe pistons, 4 piano levers, and three key cheek buttons, the console still didn’t have enough switches to control all of the relay functions and toy counter effects. To correct that problem, Terry Nace, who also configured and installed our Artisan relay, made and installed two beautiful custom pull-out drawers for us with 24 Walker Technical Company piston buttons on each. In addition to the relay functions and toy counter effects, the 48 piston buttons also control several digital voices on all three manuals and pedals using the Milan Masterworks 331 on Hauptwerk. Please see the Opus 501 Specifications for details regarding the piston functions on the drawers. Shown below is a picture of the console showing both drawers (photo courtesy of Terry Nace) and below that are two closeup photos of the left and right drawers. You can click on each of the pictures to open a larger, clearer picture of each. After 11+ years of work, the restoration of Opus 501 is finally completed. A true labor of love. The last and arguably most important part of the installation of the organ is the tonal finishing, and we were privileged that Clark Wilson and Carlton Smith, two of the best in the business, agreed to perform the task for us. For those who aren’t familiar with tonal finishing, it is a process during which all of the pipes in a particular rank (i.e., all of the pipes that make the same sound, for example, all 61 pipes in the Clarinet rank) are regulated so that they all have the same timbre and volume so that one pipe in the rank does not sounds differently from any other pipe in the rank. At the same time, all of the ranks in the organ are terraced so that the volume of each rank in the organ is regulated so that the rank that is supposed to be the loudest, in our case the Post Horn, is louder than the Brass Trumpet, the second loudest rank, and so on and so on. Tonal finishing is a laborious process that must be performed by experts with the experience, talent, and expertise to know exactly what needs to be done. In our case, Clark and Carlton each worked on the organ for about 60 hours over a 7 day period. We can honestly say that the results far exceeded our expectations and we would highly recommend Clark and Carlton to anyone considering the tonal finishing of their instrument. 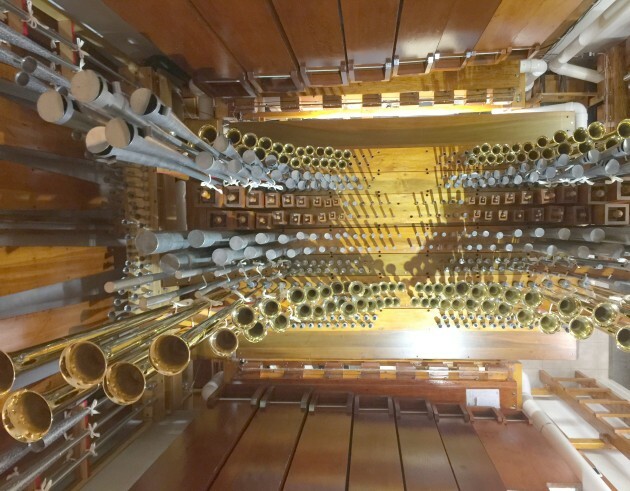 Every one of the 1,181 pipes and 6 tuned percussions are now installed and playing! The pictures below show the recently completed Solo Chamber, which includes (from left to right in first picture) the Kinura, Brass Trumpet, Orchestral Oboe, Quintadena, Tibia Clausa, Oboe Horn, and Brass Saxophone. The second picture shows the same ranks (from front to back) taken from a different angle, and also shows the Tibia Clausa offsets (top and bottom of picture) and the Austin Post Horn and 16' Wood Diaphones at the left of the picture. 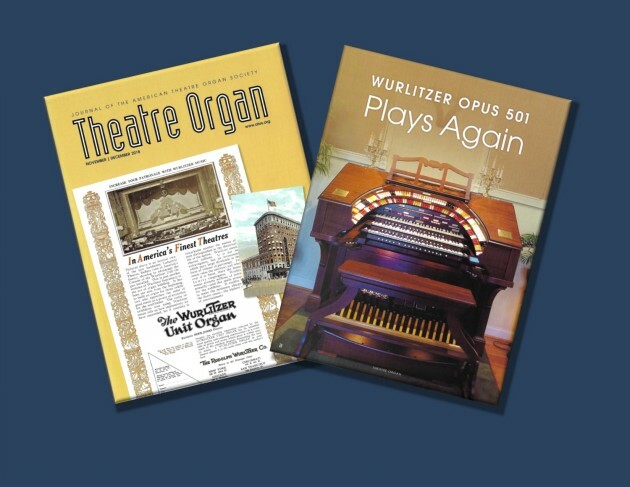 WANTED: If you are the owner of "The WurliTzer Pipe Organ: An Illustrated History" with "Opus 501" printed on the cover, we would gladly purchase a new copy of the book for you if you would kindly consider trading your copy to us. We didn't yet own Opus 501 when the book was published and consequently didn't request that edition. Just go to the "Contact Us" section of this website and send us an email. We would REALLY appreciate it!